The New Humanitarian | Where is the money to help poisoned children? Where is the money to help poisoned children? Aid organizations and rights groups are putting more pressure on the Nigerian government to release a promised US$5.4 million in aid for lead-poisoned children, but government officials keep ducking the issue. Last week Nigerian and international specialists, aid workers, scientists, ministers from Zamfara State in northwestern Nigeria and local cultural leaders gathered at an international conference in the capital, Abuja, to map out a collective plan to clean up poisoned sites, test and treat affected residents - mostly children - and put in place safer mining practices. In November 2011 the federal government committed US$5.4 million to help the poisoned children, but none of this money has been released, and the delay has not been explained, said MSF. “Without delay, the $850 million naira from the ecological fund must be released in order to begin the environmental remediation [cleaning] and the safer mining programme in Zamfara State,” Gayton said at the close of the conference. Thousands of children in Zamfara go untreated while their villages await remediation, excluding them from chelation [removing lead from the body] while they are continuously re-poisoned. Lead poisoning is caused by artisanal mining practices in the gold-rich but otherwise largely impoverished Zamfara region, when independent miners use crude hand tools to extract gold from crushed ore in their villages. The toxic dust contaminates soil, water, food and homes. Children under five years of age are especially vulnerable to poisoning, as their bodies weigh much less and absorb far greater amounts of lead from the environment than adults. Lead-contaminated dust is also more likely to be ingested by children as they crawl on the ground and put dusty hands in their mouths, while their vital organs and cognitive abilities are still forming. 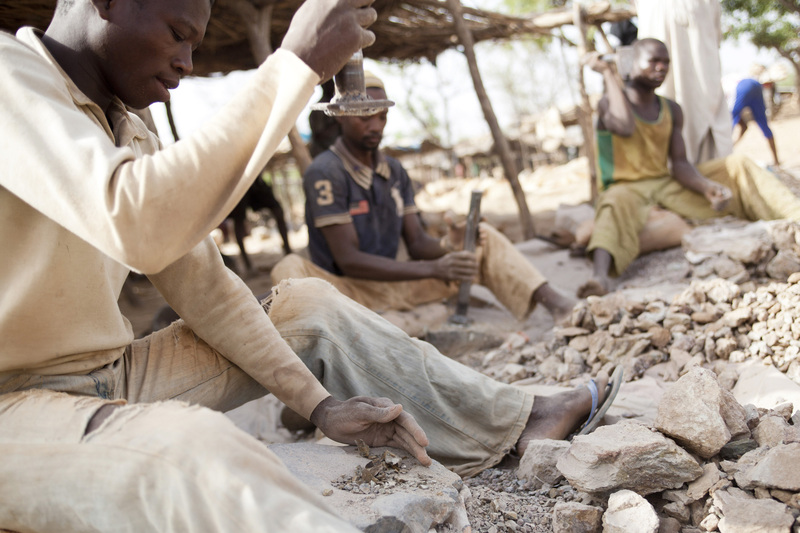 Zamfara’s lead crisis came to a head in 2010, when skyrocketing international gold prices (1 ounce of gold is valued at approximately $1,600) prompted scores of residents to turn to artisanal mining. “The state government is doing all it can with its limited resources,” said Mouktar Lugga, Environment Commissioner for Zamfara State. The state has been working with US-based environmental engineering firm Terragraphics to clean seven of the affected villages, while Geneva-based MSF has treated over 2,500 children under five. Yet no federal minister of mining, the environment, or health attended the conference, and no concrete action by the federal government was announced. Professor Abdulsalami Nasidi, Project Director of the Nigeria Centre for Disease Control, spoke on behalf of the government during the conference’s closing remarks, and stressed that Nigeria’s high-level officials are engaged with the needs of Zamfara. “The federal government is regarding this problem not only as an emergency, but a chemical warfare declared on Nigerian children,” he said. On behalf of the ministers, he pledged to follow up on the issue, which Cohen says is a legal responsibility. “The government is obligated under international law to protect the rights of these people, and they’re really failing in this duty,” she said. The village of Bagega is widely considered to be the largest and most contaminated region in Zamfara, with some 1,500 poisoned children requiring treatment. Minimal remediation has begun, but the scale of the village’s toxicity demands more resources than are currently available. After a visit there, Cohen said that messaging about safety practices from NGOs and the state government are beginning to have an impact on local residents. She encountered one family who had cleansed their own home of lead by replacing contaminated soil and mud with clean materials, without external resources or expertise. “They’ve given up on their government,” Cohen told IRIN. However, if the remediation is not thorough, families remain at risk. “A lot of the bricks in people’s homes in Bagega were made of contaminated mud,” she said. “Even though that family took out six inches of soil and replaced it with clean soil, their walls are still dangerous." Despite the standstill in releasing federal funds, delegates to the multidisciplinary conference announced an action plan for Zamfara, including creating a state-level rapid response team, a plan to include local communities in policy development, and a push for safer artisanal mining technologies. But this must not excuse the government from fulfilling its responsibility, Gayton said. "This 850 million naira would be an amazing first step to addressing the problems in Zamfara state."